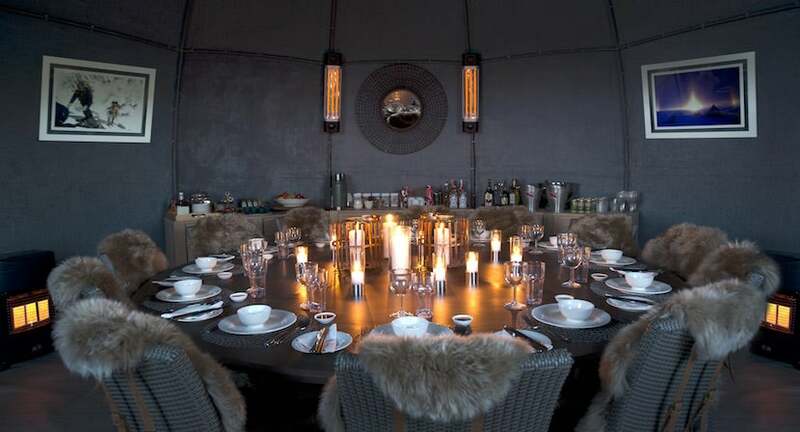 Billing itself as Antarctica’s “first and only luxury camp,” White Desert was the brainchild of husband-and-wife adventurers Patrick and Robyn Woodhead, who got the idea for what they described as a “new kind of camp” while waiting out a storm (and watching their supplies diminish) in a tiny little tent in the midst of Antarctica for four days back in 2006. 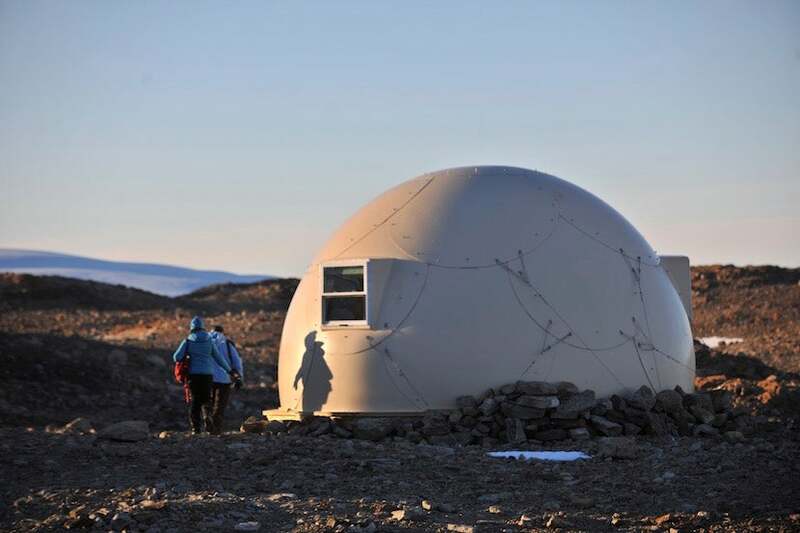 Their goal was two-fold: to create a place that would allow everyday travelers the chance to see the real Antarctica, but with the comforts of home (or at least a well-stocked home away from home) and to use the continent’s abundant wind and 24 hours of sunshine to power the place. 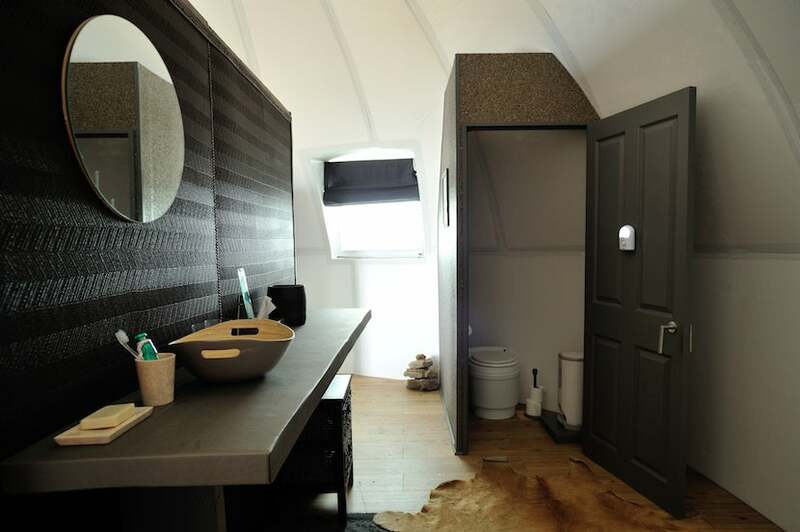 Appropriately, White Desert’s fiberglass sleeping pods look like igloos. Image courtesy of White Desert Antarctica. The dining room, complete with fur throws to keep guests warm, recently got an upgrade. Image courtesy of White Desert Antarctica. Fast-forward 10 years, and White Desert’s Whichaway Camp — home to six igloo-shaped sleeping pods recently upgraded with luxury fabric headboards, Saarinen chairs, fur throws, en suite bathrooms and separate pods for showering, cooking, dining and lounging — has become a bucket list destination for travelers the world over and the ultimate once-in-a-lifetime glamping trip that only a handful of people have ever experienced. Extended en suite bathrooms are part of a recent revamp. Image courtesy of White Desert Antarctica. Guests begin their journey in Cape Town, South Africa, a mere 5.5-hour flight from the camp, and can choose from one of two adventures: Emperors & South Pole or Mountain & Emperors. 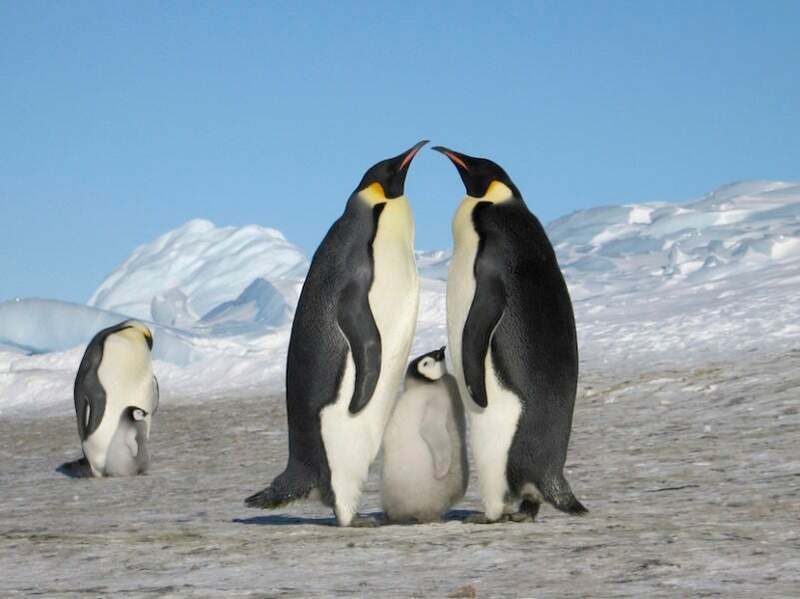 The trips range from seven to 11 days long, with a variety of field guide-led excursions planned for each day, including a two-hour flight to Atka Bay, which is home to a colony of more than 6,000 Emperor penguins. The former journey also includes a trip to the South Pole, the lowest point on Earth, while the latter lets guests explore the mountains surrounding the camp. For time-strapped travelers, there’s also a compressed one-day version of the experience, which is appropriately dubbed the Greatest Day. Atka Bay is home to a colony of more than 6,000 Emperor penguins. Image courtesy of White Desert Antarctica. Though White Desert’s guiding philosophy is “Do as much or as little as you like. It’s your adventure,” adrenaline junkies will not be disappointed: rock climbing, abseiling and kite-skiing are just a few of the activities that can be arranged. For less danger-prone types, there are ice tunnels to be explored, science bases to visit (including an American station with its own gift shop) and picnics to be had. It’s kind of like a Choose Your Own Adventure novel, but with lots more ice. And with starting prices at 64,000 euros (~$72,019), it’s sure to be a once-in-a-lifetime bucket list experience, for most of us anyway. Featured image of the lounge courtesy of White Desert Antarctica.